Kembu, literally meaning ‘Sword Dance’ an another name ‘Ginkenshibu’, is one of the Japanese traditional arts that uses the Japanese sword (Katana) and fan (Sensu) to portray the lifestyle of the Samurai through performing to poetry written by samurais while wearing Kimono and Hakama that Samurai wore in Ancient Japan. 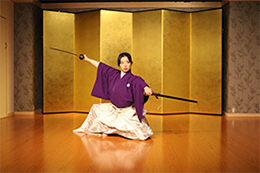 The original forms(kata) using Japanese swords in “Kembu” was created by the Samurai in the warring (Sengoku) period. However, it was only until the Bakumatsu period (Final years of the Edo era) that Kembu was performed by the Ishin-Shishi, a group of Japanese political activists who possessed the spirit of the Samurai. 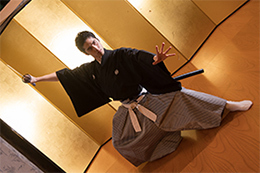 The Ishin-Shishi combined the various sword forms that the Samurai created and made it into “Kembu”, a performance involving the use of Japanese swords and fans while reciting poems written by themselves or samurais in the past. It is said that the Ishin-Shishi performed “Kembu” for the purpose of boosting morale, meditation or to express their will. A single act in Kembu usually lasts for as short as only two and a half minutes, but it carries with it the spirit and perspective of the Samurai that they have built up over the span of 700 years when they held political power in ancient Japan. It can be said that most of the aspects of the feudal way of thinking in the Samurai Culture, where social hierarchy is strictly observed and one’s rights and freedom is not recognized, strongly forms the roots of the way modern Japanese live their lives. In particular, the appropriate behavior of the Samurai such as having a strong conviction, taking responsibility for one’s words and actions, and being an upright person are highly valued morals even in modern day Japan. We, who inherit the Samurai culture (Bushido), wish to pass it on to modern society as a traditional art form in a more easily understood manner, thus naming it “Samurai Kembu”. By making a place where people outside of our industry can easily come into contact with Kembu, we hope to spread traditional Japanese culture to more people as an old yet new discovery. 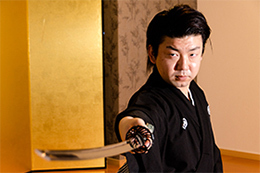 Established Samurai Kembu Co., Ltd.